Last evening the weather was glorious, which is normal after any severe storm but feels a bit cruel, too. Under the bright sky after the tornado, the damage is somewhat worse than I first saw yesterday morning. 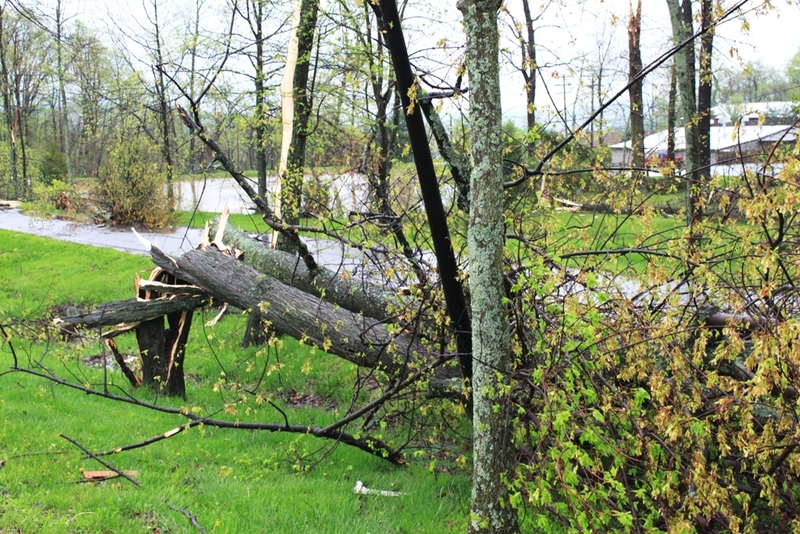 The vastly improved conditions gave me a chance to better look at the damage from the morning's storm. Sometime yesterday the weather folks confirmed it was an EF1 tornado that caused the damage. An EF1 tornado is the second least destructive on the scale of 0-5, with winds estimated at 86-110 mph. Roundtop's weather station was just yards from the worst of the damage, though not in its direct path, and still managed to record a wind speed of 80 mph. Probably this tornado was in the lower to middling part of the EF1 range. 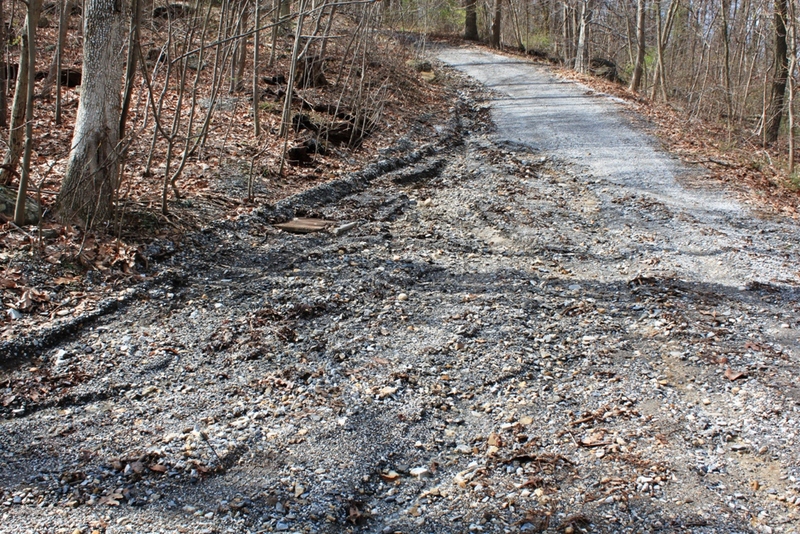 This photo shows the public Roundtop Rd. to the left and the driveway in to the ski resort branching off to the right. 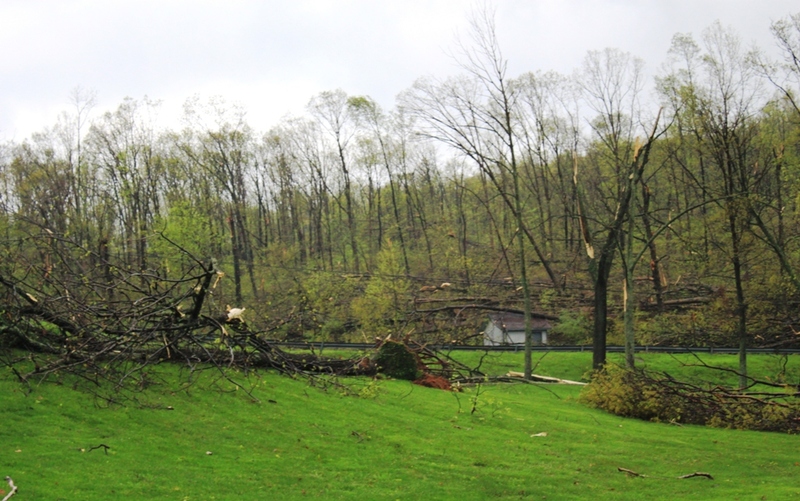 I also learned yesterday that several of the buildings at Roundtop some relatively minor damage. An old building that housed the original snow-making compressors was torn apart. Those compressors hadn't been used in years and the building was old, and not in great condition. Also the ski patrol chalet has a basketball-sized hole in it at one spot. Currently, it's not known what caused that hole. 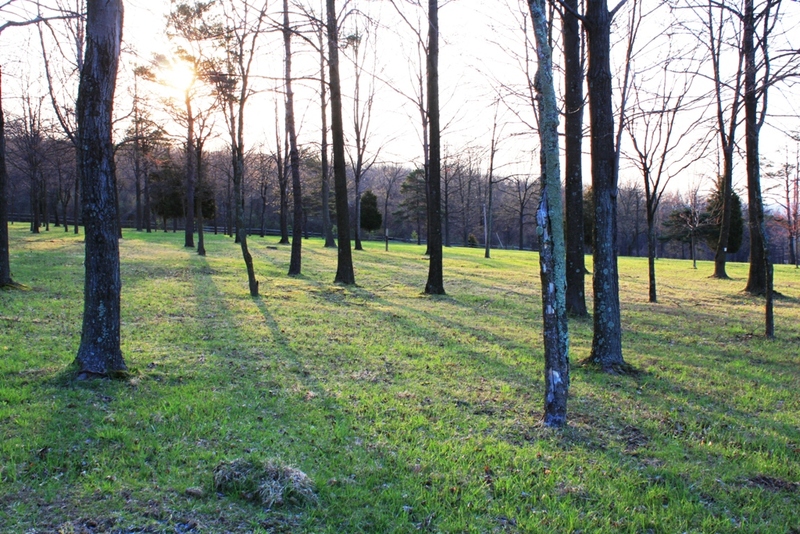 The forest on the hill across Roundtop Rd. 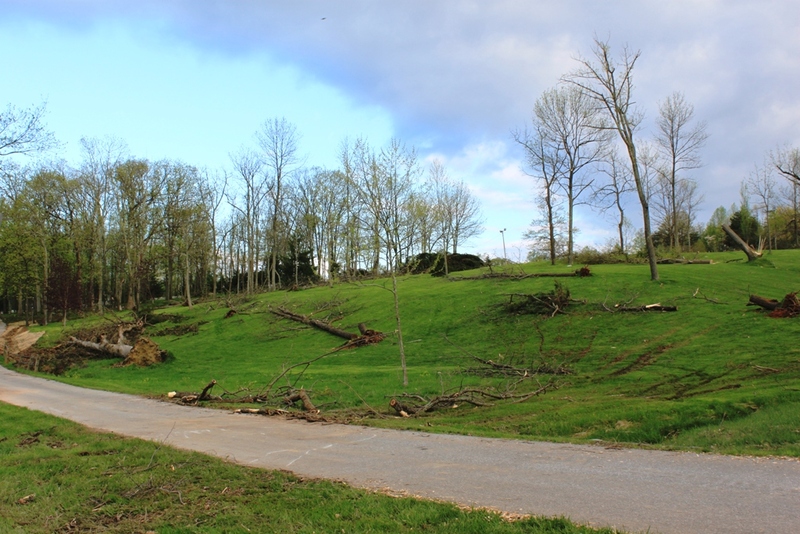 from the resort's driveway is flattened. The little pumphouse at the bottom of the photo looks okay, though. 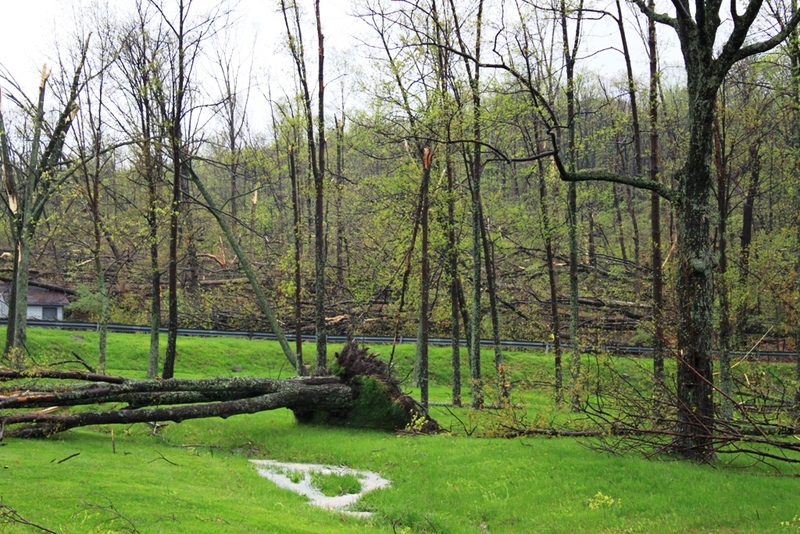 The flattened trees extend uphill a short ways beyond the left side of this photo, but not too far. I have noticed a few trees further up the hill that were damaged, but not so many, just a few deeper within the forest. 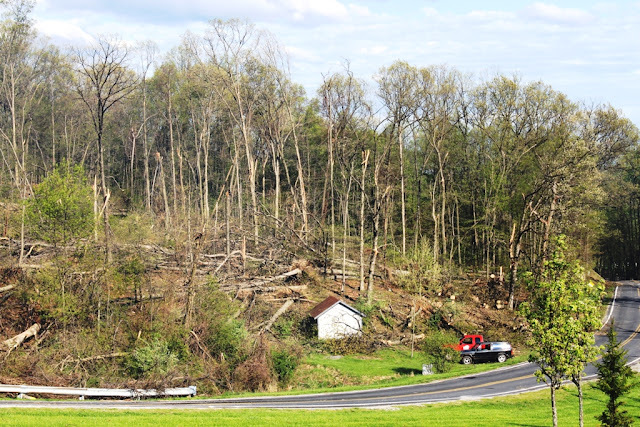 This last photo was taken along Roundtop's driveway this morning, and you can see just how many trees were flattened here. A whole phalanx of tree-trimming trucks were at work when I left this morning. By tonight, likely all that will be left are stumps. My hope is that when trees are replanted to replace these, that they choose native species, oak and hickory perhaps, and not put in the ubiquitous Bradford pear or the like. Tornado or straight line winds? I am okay. The dogs, cats and chickens are okay. The cabin is okay. 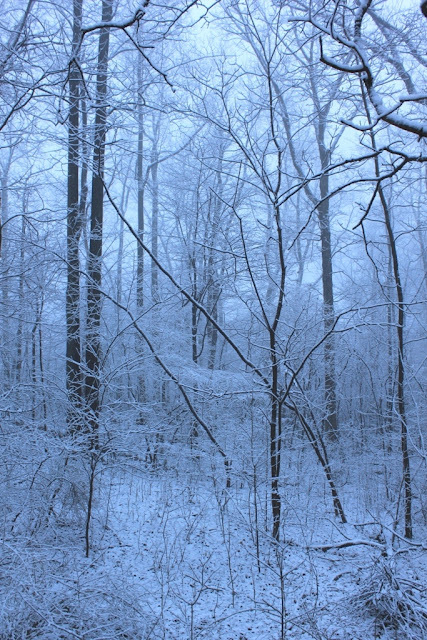 Even the trees around my cabin are okay, but just a few hundred yards away from my front door, things are not okay. 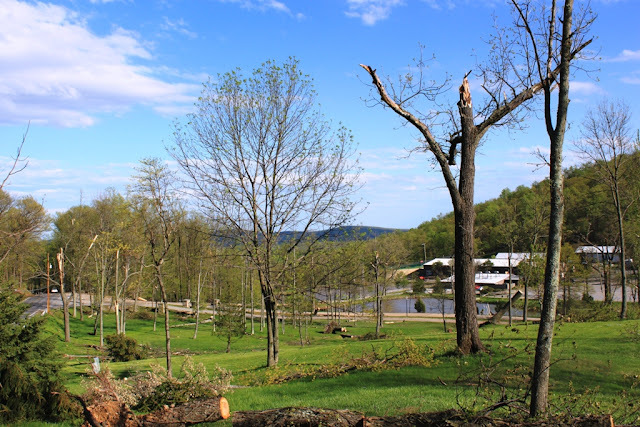 At 6 a.m. this morning either a tornado or straight-line winds blew across the mountain, at a speed of 80 mph, which was clocked at a weather station on Roundtop that a local TV station installed and which spits out weather info every 10 minutes. I'd been awake since 4 a.m. by bad thunderstorms and heavy rain. I got up at my usual 5:30 a.m. and checked the weather radar. A storm was coming my way, and the lightning and thunder started getting bad, so I turned the TV off. At 5:45 my sister called to report we were under a tornado warning and that Roundtop was right in the path. I grabbed the dogs, two cats and headed for the bathroom, the basement already getting some water in it, and besides, I didn't really want to go outside to get there, anyway. Within a few minutes, the storm intensitified, and then the wind started to rise. The wind and the noise started getting very loud and just kept building. I started hearing little things falling on my roof--just leaves and acorns, probably. Then for 5 seconds it got very, very loud. I won't say I heard the "freight train" but it was only a few steps below that. It sounded as though it was overhead but not actually on the cabin. And just about when I was thinking this wasn't going to be good at all, it was gone. So I gave it a few minutes, said "Whew" a few times and proceeded to take Dog for a walk, and when I got close to the lodge, that's when I saw the first of the damage. The tree in the photo above is twisted, so until someone tells me different, I'm calling it a tornado. As far as I could see, the lodge itself and surrounding buildings are okay. I saw some small pieces of building debris--flashing, mostly, or other small loose stuff and not a lot of that. Across the road from the resort, over by that small building (a pump house), you can see trees in the forest just flattened by the wind. The road itself is still blocked to traffic. I was finally able to get out by driving on a dirt road and then leaving by a normally-closed access road and avoiding this area. I don't know how far down the road the damage continues. I haven't been out that way yet and won't be able to get there until that part of the road is cleared. 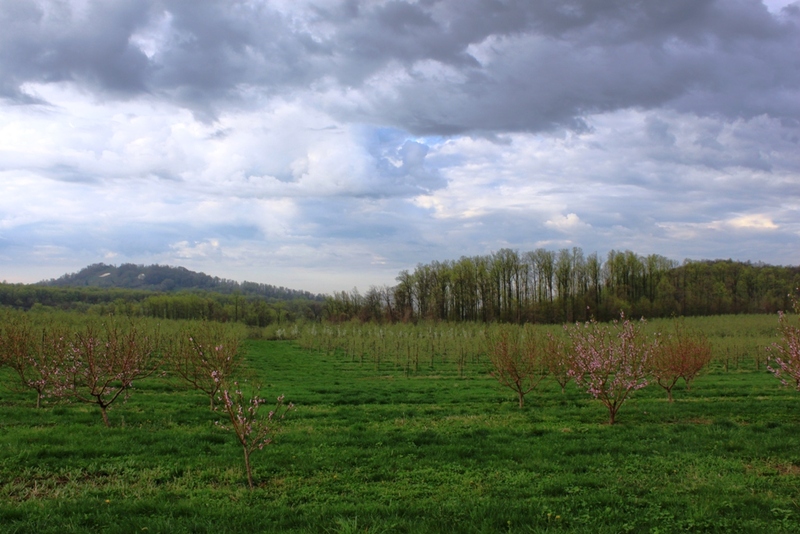 Right now the sky is clearing, and the weather is improving. A few schools are closed. 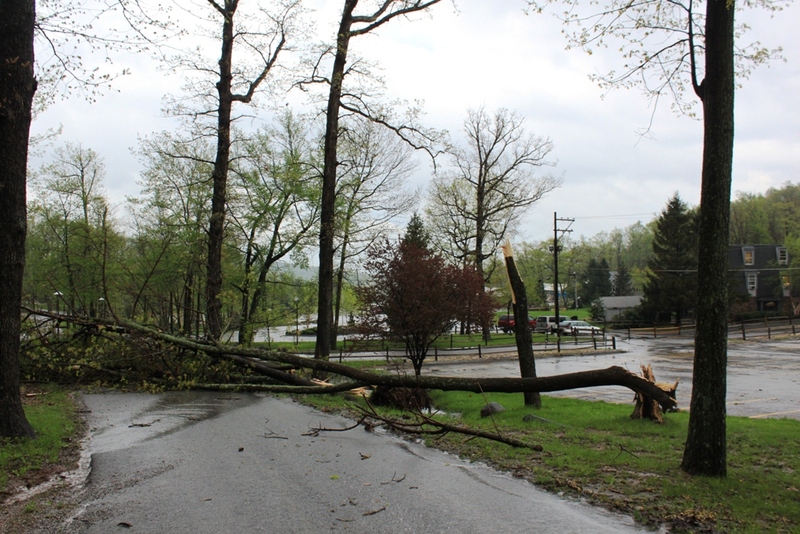 There's lots of localized flooding but the main part of the storm is now over, and now the clean-up is underway. A wood thrush called last evening, the first to arrive. This morning several more joined the chorus. that sounds so impossibly lovely? a bit like an echo, a call to spring. like a present, or a cat winding between my ankles. "I'm here, let the spring begin." 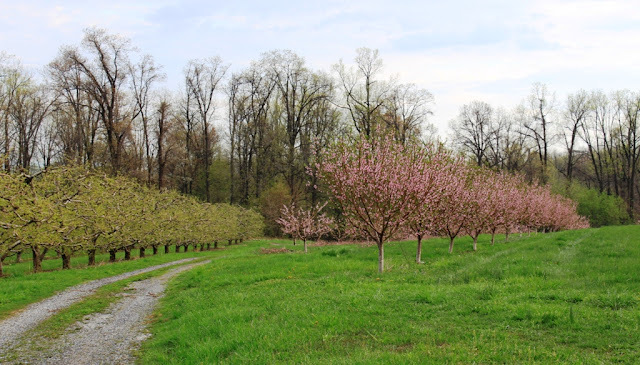 While I'm waiting for the woods to dry out enough to get down into them, I thought I'd post a few photos from the neighbor's orchard, which is just starting to bloom. In this photo, notice that Roundtop is just peeking up behind the hill, still with a few very small patches of snow near the top. I can't resist a dirt road, or lane or path. ﻿Occasionally, the sun comes out. This is a pretty big snapping turtle. 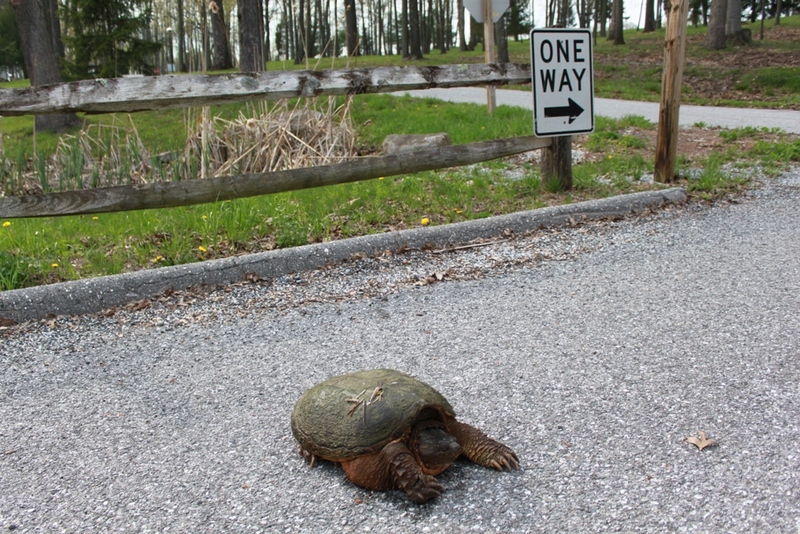 It’s not the biggest snapping turtle I’ve ever seen, but it’s certainly on the upper side of the bell curve. I saw it last evening as I was attempting to access my mail box and had to drive the long way around in order to avoid this fellow (or girl). Without a measuring tape in hand or getting any closer than I already was, my best guess is that from nose to tail this one measures close to 2 feet. Its front feet are the size of a big chocolate chip cookie, and I wouldn’t want to get very close to those claws, let alone the mouth that’s just behind them. A snapper this size could take off a finger in a single bite, and I wouldn’t want it anywhere near any other body part, either. This snapper was apparently moving between ponds at Roundtop, perhaps lazing its way down the seasonal stream that runs beside the main parking lot. Perhaps it was too big to travel through the drainage ditch that goes under this road and was simply going over the road in order to continue on its way. Perhaps it decided to sun itself for a few minutes in the process. 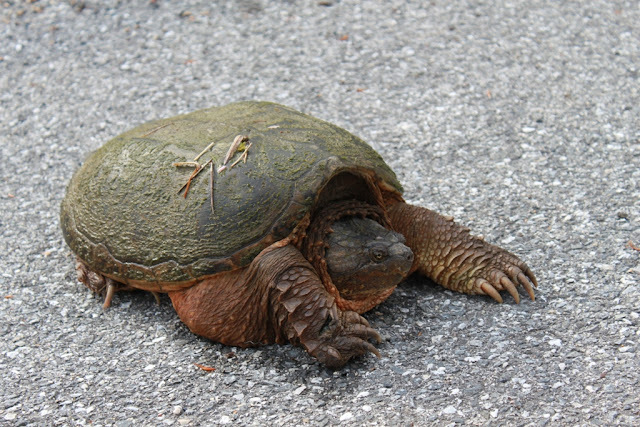 Snapping turtles are pretty common here, especially with all the snowmaking ponds and streams around. It is not terribly common for them to appear on dry land. I see them a few times a year, though their path of destruction is more visible than that. They are pretty hard on the mountain’s crops of ducklings and goslings. A snapper this size could probably take mama duck, too. It’s just not everyday that I catch one going the wrong way on a one-way street. But like an 18-wheeler, this one has whatever right of way he wants. Rain is not going away! Ah, the rain, the rain! It’s just not going away this April. 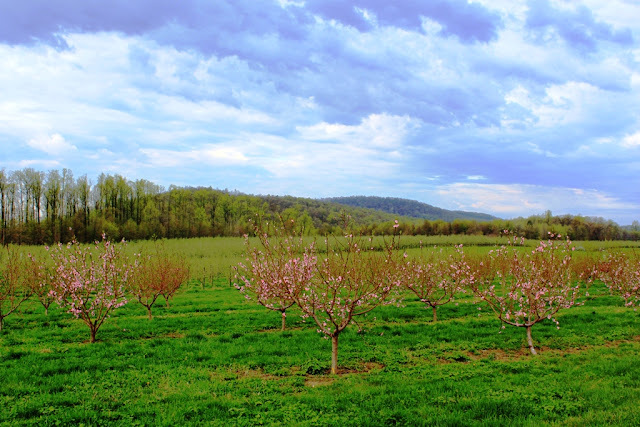 If I thought it would do any good, I would threaten Grandmother Nature and say, “this year’s May flowers had better be spectacular!” Before the day is over, this April will go down as the wettest ever since record-keeping began some 125 years ago in this area. And April still has more days to it, with more rain in the forecast. That record is likely to be shattered and not just broken. For me, the rain means a lot of mud, few photographs and fewer opportunities to bird or sit outside to enjoy the warming weather. On the one morning when the rain was not falling, I had blue-gray gnatcatcher, and both kinglets in my driveway. And they were close, which turned out to be a good thing, since it was so foggy, I couldn’t see the tops of the trees. As close as the birds were, I still wasn’t able to see much color on them, as the fog was that thick. 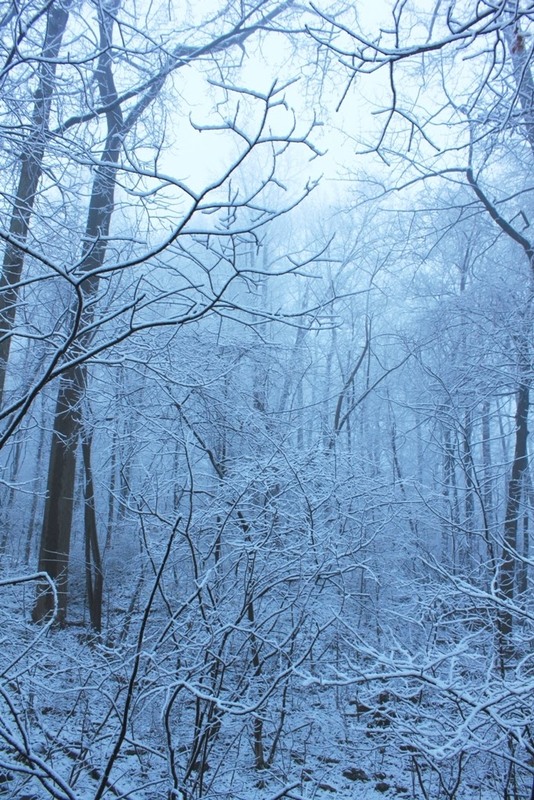 Everything looked gray and white. Even the trend towards seasonal warming is unpredictable. Saturday evening I had a fire and by Sunday afternoon the windows were open. As you can see by today’s photo, the trees are still pretty bare of leaves or even buds. 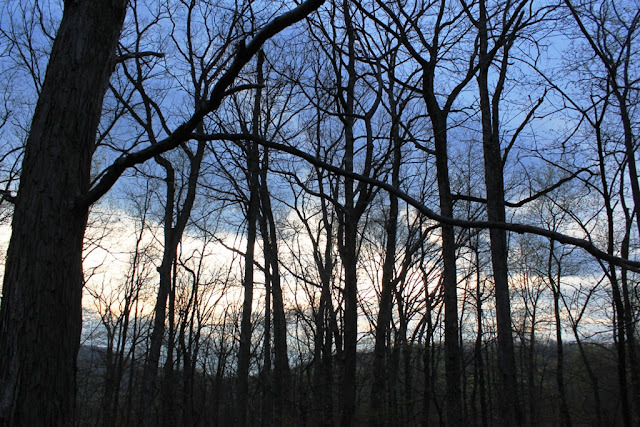 I am at the point of the season where even a day makes a difference, and this morning I can see the first of the leaf buds, so this less than 24-hours old photo is already out of sync with the reality of the morning. I think I’ll be glad when this April is finally over! I’m hoping that if nothing else, May will bring some nicer weather! Spring is beginning to spring here on Roundtop Mtn. It's been a little tough to find amongst all the rainstorms, tornados and dense fog. Yesterday brought sunny weather for several hours. 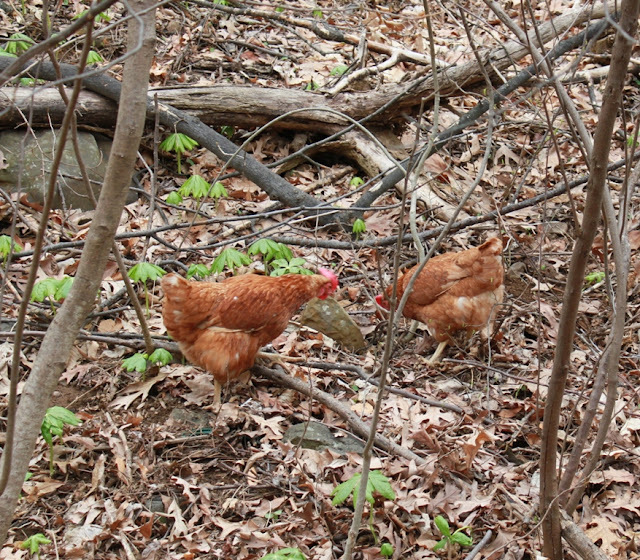 The chickens were glad to get out of their pen and roam around the woods. A few found worms, which to chickens is apparently a lot like finding gold. The others scratched and found other good stuff. They certainly had a good time. 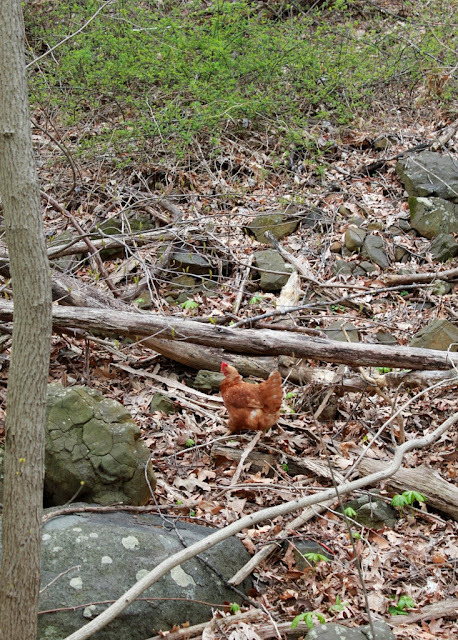 Who'd have thought that chickens would like the woods so much? They are pretty canny, too. Yesterday, I heard one squawk with the danger signal and went out to investigate. They'd all run back into the pen as a red-tailed hawk soared overhead. Smart girls! A few migrants are starting to pass over as well. 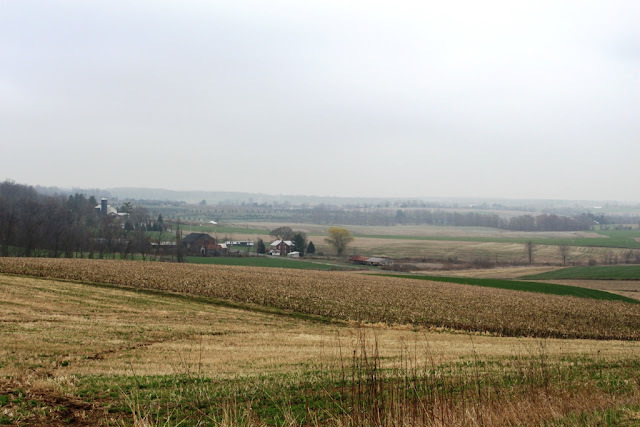 In dense fog on Wednesday morning I had blue-gray gnatcatcher, ruby-crowned and golden-crowned kinglets. I've gotten reports of warblers elsewhere but so far they haven't visited here. Down at Lake Pinchot, a spotted sandpiper bobbled its way along the shoreline. 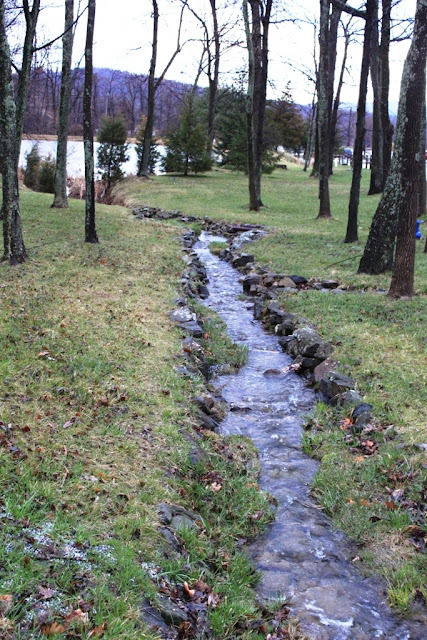 Spring is still slow here, especially when compared to recent springs. 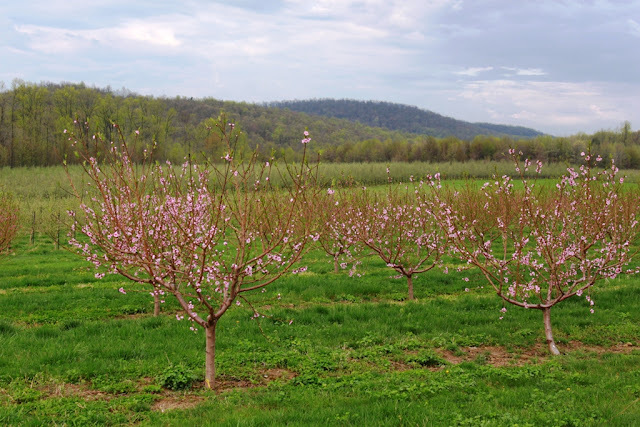 I am only just starting to see the first hints of redbud trees, though I really have to know which trees to look at to see those red buds. Dogwood is also starting but only a few trees. It's not just the rain that's kept spring from exploding. With a few days of exceptions, temperatures are averaging about 10 degrees lower than average. The few sunny days have been near normal, but there's been so few sunny days that they don't have much impact. So for now I am just waiting, still using the fireplace occasionally and waiting for the next batch of weekend rain. Spring will arrive eventually. In fact, at this point, it wouldn't entirely surprise me if spring pretty much bypassed this area entirely and ended up with summer being the next season on the mountain. Getting a nice photo in the midst of rain and ugly light is proving to be a challenge. So I grab a few shots when I can and then wait for the conditions to improve. So far the improvement isn't scheduled for another week, with perhaps Thursday as the lone exception for the next 7 days. Nice isn't a word I will use about the weather this year. 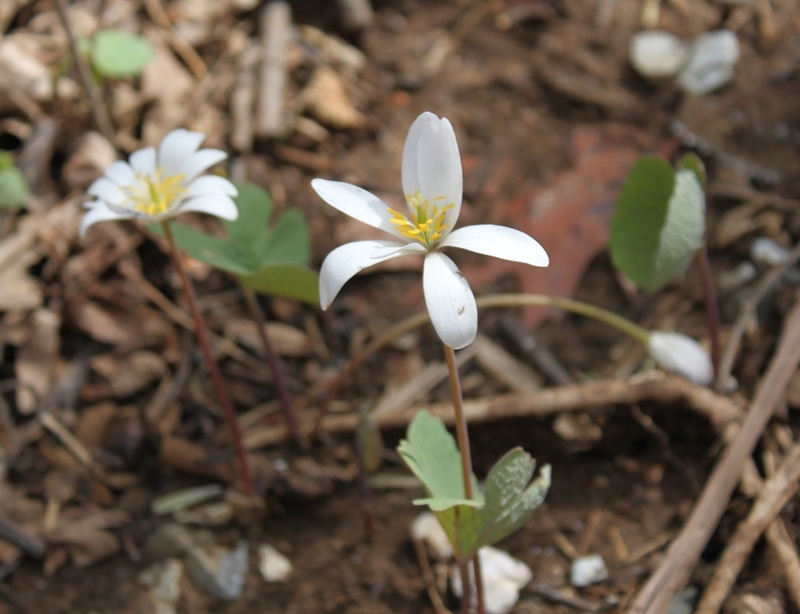 The first photo is bloodroot, one of my spring favorites. The flower has waxy petals and lasts but a day, or rarely two. They bloom at the end of my front porch. I wait for their blooms every year. I have 364 days of waiting before the flower blooms again. Isn't it amazing that these gorgeous flowers bloom for just a day? I have to wonder at the evolutionary forces that selected for this and makes a one-day bloomer the winner in the evolutionary scheme of things. Apparently it works, but that's not something that seems as though it should. My second photo today is a spring beauty, one of at least several flowers that apparently fall under that term. This is one of the more common flowers in my forest. At the moment, only the first of the flowers are blooming. In a good year, perhaps in another week or so, the forest floor will be nearly covered with them. Saturday brought 3 inches of rain, including nearly half an inch in 10 minutes, according to Roundtop's weather station. The rain was the heaviest and for the longest amount of time that I think I've ever seen. It was a downpour, the kind that usually ends after a few minutes. Except that this one didn't end for hours. The rain came with thunder and a tornado warning, but the tornado stayed away from my cabin. The rain soon turned into flooding, and two days later, water is still flowing off the mountain and pooling in meadows and anything that might be a low spot, even if it didn't look like a low spot until Saturday. Now I am left with a severely washed out road, and it's this kind of day that makes me glad of four-wheel drive. Roundtop will fix the road soon enough, I expect, though soon may not be until Thursday or so, which is the the next day that doesn't have more rain in the forecast. 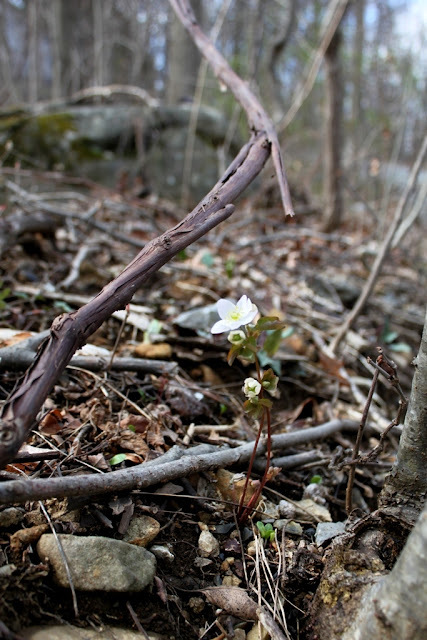 Other than that, the bloodroot has boomed, and the first of the spring beauties are also out. I'll have some flower photos tomorrow! After one warm and sunny day, hints of spring growth are edging past the hint stage and moving into the almost there stage. Today may be the day for the bloodroot, that gorgeous one-day wonder of a wildflower. If so, I hope I get to see them. By late afternoon when I arrive home, they are already in a shadow created by the cabin, and that’s usually enough for them to decide the sun has gone behind a cloud and it’s time to close up. And tomorrow will bring rain, which will certainly keep them from appearing. Both the violet photos I posted the other day and the bloodroot are among the earlier wildflowers. I’m not really expecting to see many different kinds again for a while. The trees, even the redbud, haven’t started yet. 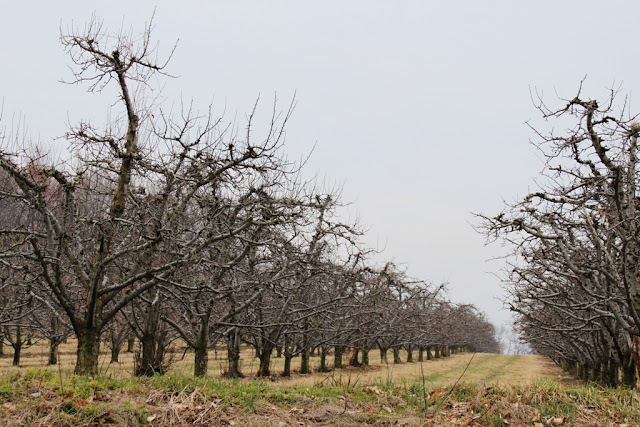 The nearby orchard blossoms are still nonexistent, and those trees look as barren as they do in midwinter. But if the greenery still has a ways to go, the local birds are pairing up and preparing to settle down to nesting duties. I’ve seen a pair of mourning doves staring at each other in the middle of the road at the exact same spot for the past three days now. 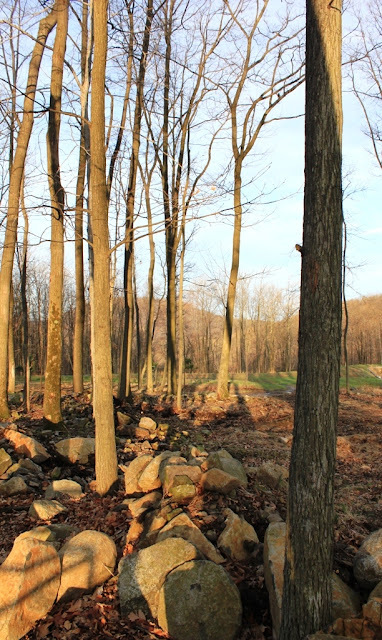 The pileated woodpeckers resound with riotous laughter as they swoop through the forest. They always nest near the cabin, if not in the exact same spot. This year, I think I know which tree they are favoring, and I’m hoping I’ll be able to watch some of their nest action from my back deck before the leaves grow out too much. Spring is a busy time in the forest, and it’s only going to get busier, by a lot, in the coming weeks. If the old saw, “April showers bring May flowers” has much truth to it, May should be spectacular. This year I’ve seen a lot more April showers than I really care to. The mountain, and I guess much of the east, feels kind of stuck in a weather pattern that barely leaves a day of no rain in between spates of more rain. And lately, that day of no rain hasn’t been much to write home about. As often as not the no rain day looks as though it’s going to rain buckets at any second, even if it doesn’t. Until today. Today is this April’s all-too-rare sunny day. My eyes are so unused to the sun that I was wearing sunglasses by 7:30 a.m. this morning. And for the first time this year, the dawn chorus of birds and frogs was singing loudly, if still populated largely by robins and cardinals. The forest is starting to sprout. The tops of the mayapples are just breaking through the ground. At Roundtop, the understory is starting to appear, though I have the sense the growth is a bit later than it’s been for a few years. Not late in the sense of a 20-years ago late, but late when compared to the earlier springs of perhaps the past decade or so. All of which has me thinking, well, hoping actually, that this might be a good year to see warblers here on the mountain. Warblers, spring’s colorful little jewels, are biologically primed to arrive when certain buds and the bugs that love them appear. Each species has its preference at the bug buffet, but in recent springs, the buds and bugs are out before the warblers arrive. One result of that I’ve noticed, is that the warblers don’t hang around very long before flying ever northward. It seems that they barely light before they are moving north again in search of that ultimate bugfest. This year, perhaps the timing will be closer to normal and give me a chance to see more of those little beauties. I can only hope. All it took was one sunny day for the first of the forest’s wildflowers to make their appearance. 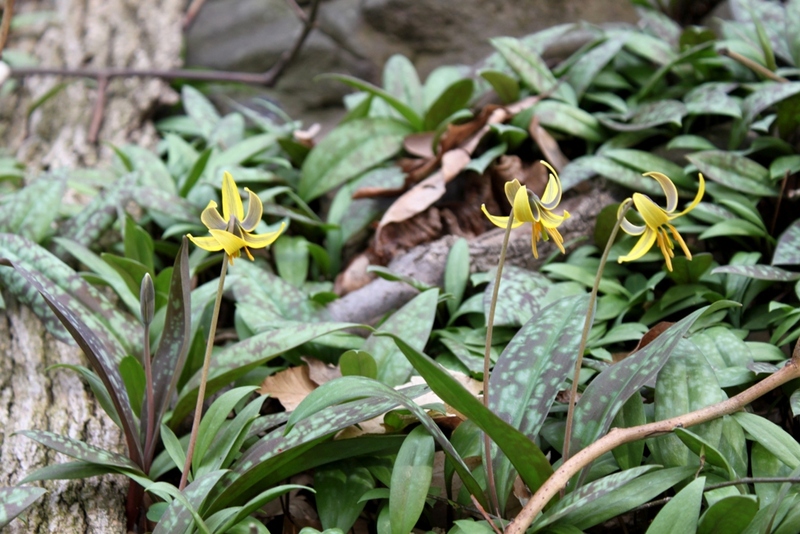 These dog-toothed violets (or trout lilies) grow every year about two steps from the cabin door. The size of the leaf patch would suggest that I should see 20 blooms or more, but that never happens. Some years I only see a couple of blooms. This year, so far, I have 3 blooms in a row, with a fourth just to the left of these three about to make an appearance. Still, it’s a lot of leaves, a patch perhaps a yard square, for the number of blooms that are produced. The plants flower very close to the same time each year. Last year I blogged about them on April 14. The patch grows happily right at the end of my driveway and has been there pretty much every year since I’ve lived here. I look for them every April. My biggest problem with them is keeping the dogs out of the patch. I don’t know why they keep nosing around in there. Perhaps it’s simply because they know I don’t want them to be there. I have a special joy in finding the native wildflowers growing here in their natural habitat. I know people who plant native species around their properties, and I’m glad they choose those instead of cultivated varieties. Still, I prefer finding the plants where they choose to grow themselves, as these do. It gives me the feeling that we are sharing this space, these woods, rather than me telling the space what I’d like to see here. Humans do more than enough of that as it is. Here, I try to let forest just be. Yesterday was a dreary sort of day, the kind that looks as though it’s going to rain any second, but when I looked at the radar, nothing was in sight. I spent most of yesterday with dirty hands, doing dirty jobs around the cabin. First off, I moved the chicken pen from the “winter quarters” that is largely under the cabin out to the girls’ summer quarters in the open on the north side of the cabin. That project alone took nearly half a day until I was satisfied with it. Moving the pen itself took about an hour, till I had it placed where I wanted it, the nest boxes set up again, and the gate in the direction I wanted it. Then I had to move all the accoutrements that go with the pen placement—wrapping the chicken wire over the chain link fence so the holes are smaller, moving the short pieces of railroad ties that I place outside the pen for their water. If I put the water inside the pen the girls start to play in the water and soon tip it over and cause a royal mess. Putting the water outside the pen but placed where they can reach it keeps the pen much cleaner. Doing all that pretty much took another hour. Then I had to start on the winter pile of manure, bagging that up and taking care of it. The girls, who were outside during this entire procedure, had to “help,” of course. They apparently think that I am scratching at something good when I am using the garden rake and they have to join in too. I let them help, but I have to keep an eye on them so I don’t accidently scratch one of them with my rake. They aren’t too good about staying out of the way. After I finally finished that job—another hour—I planted the first of about 20 lettuce plants. I didn’t get that whole job done. There’s still more to plant, but the entire project is at least well started. Where I live, any kind of gardening is a chancy project. I don’t get a lot of sunlight. I do get a lot of garden-eating predators. This year, I’m growing the lettuce on my back deck, in hopes that I can keep the rabbits away from it. Of course, that still leaves everything else, though I’m hoping most of everything else doesn’t have the lettuce fetish that rabbits have. We’ll see about that one. In any event, it was a good day for getting dirty. This work is the kind where I feel I’ve accomplished something by the end of the day and have something to show for it. It’s a spring thing, I think, at least to someone who has as many farmers in their ancestors as I have, to want to get your hands in the earth and get things cleaned up and ready for the new season. Dirty hands are just the proud result of a job well done. 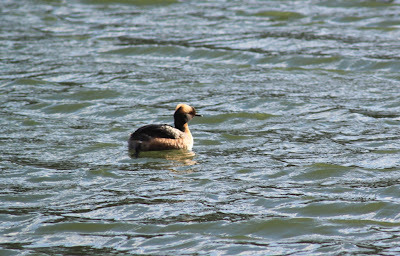 This lovely little horned grebe is my 136th yard bird here at the cabin. It’s been a while since I’ve added a new one to my “yard” list. In the first place, I don’t have a yard, of course. I count any bird I can see from my cabin as being in my yard. I found the little grebe last evening as I was returning from work. By the time I reached the far end of the pond, I could tell the little bird on it was a grebe, but it was only when I got close that I saw it wasn’t a pied-billed grebe, an uncommon visitor in and of itself. Although my camera travels with me everywhere, the entire camera bag doesn’t make every trip, and on this day that meant I didn’t have my long lens with me. 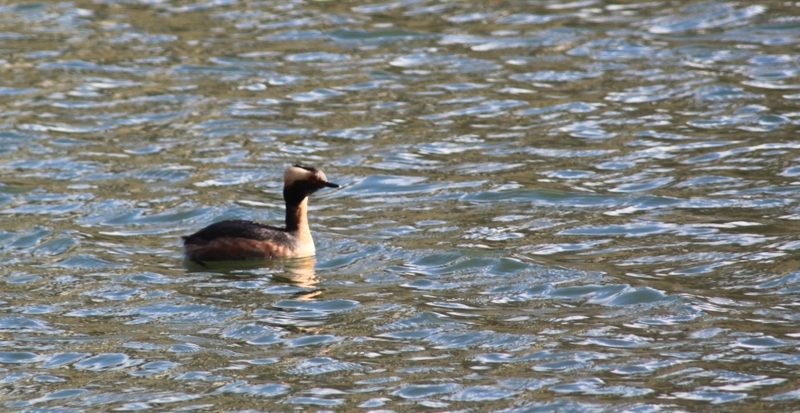 Still, I stopped and snapped some photos, figuring that although the photos would be exceptionally bad, it would still be possible to identify the grebe as a horned grebe. So I took about 20 photos with my normal lens. The little grebe was being cooperative, however, so I decided to chance driving up the hill to the cabin to get the long lens. Now once there, Dog HAD to go out, and instantly. 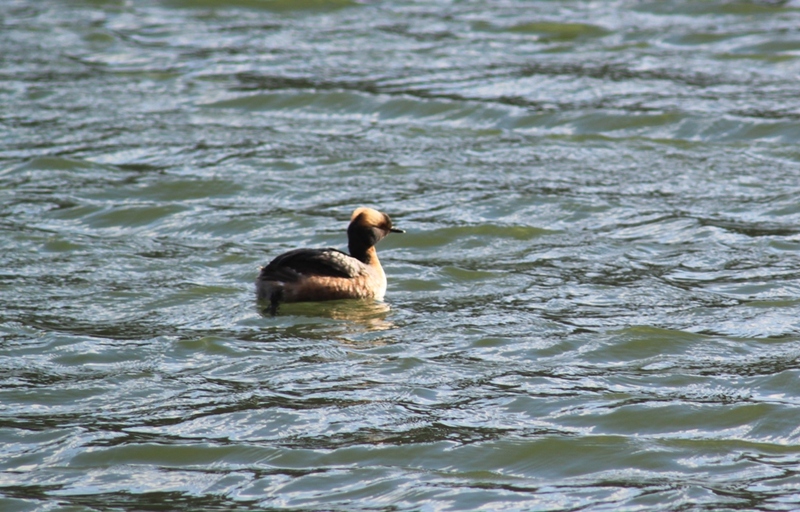 So I took Dog and the long lens, waited for Dog to pee, then loaded him in the car, put the long lens on the camera and somehow after all of that, the horned grebe was still on the pond. At first I took a few photos from the opposite side of the pond, but then I felt brave enough to drive up along the pond closer to the bird, where I stopped and took about 50 more photos, including these two. The little bird was pretty cooperative, though didn’t do much other than keep an eye on me while I took photos from inside the car. After spending 15 minutes or so snapping away, I decided to leave the bird alone. When I got back up to the cabin, I could still see it sitting on the pond. It was gone this morning. #136, you were a beauty! But is it gone for good? I can only hope that I’ve seen the last of snow for the next several months. Normally, I don’t get thunderstorms until after snow season is over. This year thundersnow has already happened several times, so even though I was awakened at 5 a.m. by a single boom of thunder this morning, I can’t count on that being definitive. Is the third-year bald eagle heading north that flew overhead this morning definitive? That’s a hopeful sign but I doubt if it’s definitive, either. I’ve seen eagles when they were surrounded by snow. The phoebe singing outside my bedroom window? Maybe. The eastern towhee calling from the back of the cabin? Maybe. It’s still too soon to call, though the signs are improving with each day that passes. Maybe this time the snow is really gone. Old man winter is playing an April Food's joke on me. I am NOT playing April Fool on you. This is the view from my back deck this morning.